2015 promises to be a landmark year for the Newbury festive season as Victoria Park becomes the centre of a new era of Christmas activities. With its tree lined walkways, scenic landscaping, the historic band stand and the large circular pond especially fitted out with fountains, the park is set to be transformed into a buzzing hive of activity centred on a Christmas Village. Santa Claus has already expressed his interest in setting up his temporary home in the centre of the village so that he can meet all the young children and all those who still think they are children. He will be there as often as his busy schedule permits, but he has promised to publish a plan in plenty of time to let us know when he will be there. The grounds will be decorated with coloured strings of lights enhancing the joys of hunting bargains and Christmas gifts amongst the myriad of options available amongst the carefully chosen selection of dozens of traders selling their wares. Traders will be selected from amongst those expressing an interest in being involved with priority being given to those who are selling items that cannot be bought on the high street and of course to those who express interest first. The traditional Christmas spirit will be visible in the form of a life size nativity scene in a stable complete with Mary, Joseph, The Baby Jesus, Wise men and Shepherds as well as the cattle and sheep that the King of Kings shared his birth place with. There may even be an opportunity for children to dress up and pose amongst the figures for a truly unique Christmas Picture. 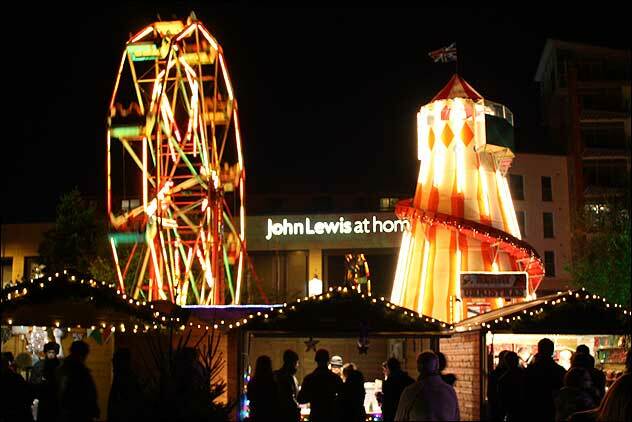 The Newbury Christmas Village promises to be a magical and unforgettable experience for the general public and for traders. A vast amount of advertising will be used to entice visitors into Newbury, and especially to bring them over to the Christmas Village and ultimately through the Christmas Market areas. Attractions such as a fun fair and a number of other activities to be confirmed will provide extra cause for visitors to enjoy wandering through the Christmas Village on their way to the food court, the Inn of Christmas cheer, the covered heated Cafe, the band stand with live entertainment and many, many more novel and unique features. The 2015 Newbury Market will take place between 21 November and 20 December inclusive. Opening hours are expected to be 10:00 until around 19:00 7 days a week. Times will vary depending on late night shopping, etc. All traders WILL be open while the market is open. Will they be paying the rent this time?